We’re continuing our discussion with George Throckmorton. He is the expert who discovered how Mark Hofmann was forging documents. Did you know that Mark actually used a toy chemistry set? It’s pretty amazing. George: We finally found the chemicals and the chemicals we found over a year after the bombs. It was in November of 1986. The bombs were in October of ’85 and I was out Christmas shopping in a toy store and happened to glance down to the toy chemistry set. And right there was gum Arabic, Roman vitriol, green copperas, and a recipe on how to make iron gallotannic ink. GT: No way, that’s crazy. George: Later on we found out that’s where he got the chemicals was at a toy store. GT: At a toy store. George: And yet they fooled the biggest laboratory in the world, the FBI. GT: So yeah, that’s crazy. George: They were looking for a more sophisticated way of doing things today than what he used. He used method that was used 150 years ago. And we don’t deal with things 150 years old. We deal with modern, at the time forgeries on checks and stuff like that, credit applications. And we’re very proficient at that, but even in the field of document examination, we couldn’t go to anybody to get help because we don’t deal with documents over 50, 60 years old. We will also discuss George’s role in the famous Howard Hughes will. (Is there anything this guy wasn’t involved with?) It’s really interesting. George: The Howard Hughes will, that was the big, if they remember that, the Howard Hughes will. He was the richest man in the world at the time and when they found the will, which they call the Mormon will, I don’t know how much you’re familiar with this story….I got involved in that quite by accident. George: But anyway, that testimony in court on Howard Hughes will, was a result of having the graphologists testifying against the document examiners. 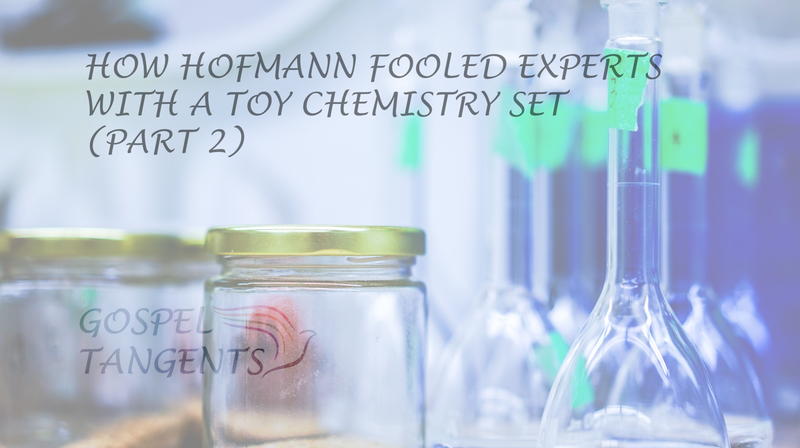 Mark Hofmann used a toy chemistry set to fool the FBI lab. Check out our conversation, and don’t forget part 1!